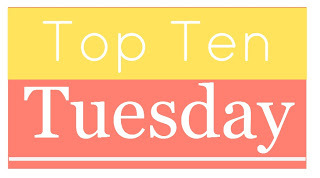 For future Top Ten Tuesday topics & info on how to participate click here! 1. The Night Circus by Erin Morgenstern: Borrowed from the library but got super busy and was never able to finish it. 2. The Sea of Tranquility by Katja Millay: Over the past few weeks I've heard SO many wonderful things about this book! I want to read it so bad! 3. Before I Fall by Lauren Oliver: I'm ashamed to say I've never read this one yet! 4. The Last Time I Saw Paris by Lynn Sheene: It's a historical fiction book set in Paris. Sounds like a winner to me! 5. The Peach Keeper by Sarah Addison Allen: Her previous books I've read I've really enjoyed so of course I want to read another book by her! 6. The Lover's Dictionary by David Levithan: I love how the book is set up literally like a dictionary (well, I think it is anyway, I haven't actually opened the book) with the words and then they meaning as they relate to the story. 7. Beauty Queens by Libba Bray: I've heard it is hilarious and it's been awhile since I've read a funny book! 8. How Music Works by John Powell: This books sounds so interesting! 9. The Sun Also Rises by Ernest Hemmingway: I've wanted to read this book for what feels like forever but for a tiny book it is always so expensive at the bookstore! 10. Everything is Illuminated by Jonathan Safran Foer: I loved Extremely Loud & Incredibly Close so much! Why don't I own this book yet? What are your Top Ten Books you hope Santa brings? OOH, The Last Time I Saw Paris sounds so good! I'm totally adding that to my wishlist, hah! And yes, so many people are raving about The Sea of Tranquility - don't wait for Santa, it's on NetGalley :) I'll be starting it soon too! I just read The Night Circus a couple of months ago, and really enjoyed it. It was different, but good. And your life cannot be complete until you've read Before I Fall -- seriously one of the best books of ALL TIME. I absolutely love Lauren Oliver's Before I Fall. I hope Santa brings it for you so that you can enjoy this beautiful book. I love The Peach Keeper... I've been hearing some good things about The Sea of Tranquility as well. Everything Is Illuminated is a wonderful book - one I'd like to make time to re-read. The Sun Also Rises is a classic too - the dialogue is hilarious. Oh, The Night Circus is fantastic. I think I need to reread it and soon. And The Sea of Tranquility. I just finished it a few hours ago. Gorgeous book. I just got The Sea of Tranquility and I can not wait to get into it! I've heard great things and I'm expecting something amazing. I'm hoping I get The Statistical Probability of Love at First Sight. Finally. I should have read it forever ago. Santa, if you bring it, I'll read it! How Music Works sounds so cool!! I'm a music nerd. That book is right up my alley. Adding to my TBR right now. :) Cool picks. Everything is Illuminated is such a brilliant book! It is so beautiful and tragic and whimsical. I really enjoyed Extremely Loud & Incredibly Close as well, but I think Everything is Illuminated is still my favourite of his. The movie is also beautiful but quite different. Still haven't seen the new movie. Before I Fall is AMAZING. It's one of my all-time favourites. It's so special. If I'm only loaded, I'd give you The Night Circus. I love love love it! <3 And The Lover's Dictionary is one of my favorite books and what got me into David Levithan. And I recently got approved for The Sea of Tranquility over at NetGalley and I'm loving it! I wanted to add The Night Circuse onto my list too. But then I realised I had ten already. So many books I want. But I would love The Night Circus. Everyone has great things to say about it. I only read 'The Sun Also Rises' from your list. I've been planing to read Night Circus, Peach Keeper & Lover's Dictionary for some time now. I even think I got them all on my Kindle. I loved Extremely Loud & Incredibly Close also. I didn't even know about Everything is Illuminated by Jonathan Safran Foer but now I want to read it too. Great list! What a great list! You'll love Beauty Queens -- it really made me "LOL". I'd like to read the David Levithan book as well. So far, I've loved everything of his that I've read. Enjoy! Beauty Queens and the Sea of Tranquillity are awesome! I really want the Lover's Dictionary too. Ooh, the Paris book sound fantastic! Also could use a funny book, I might have to check out Beauty Queens! --Great list! Hope Santa brings you some of them. "The Lover's Dictionary" is set up like a dictionary, and it is fantastic - a quick, but compelling and satisfying read. I'll be ashamed with you. I haven't read 'Before I Fall' yet either. The Sun Also Rises is on my list, too! A historical fiction set in Paris does sound perfect. Even I want to read The Night Circus, it's just arrived in my library, but it's always checked out. Everything is Illuminated is a wonderful book (and an AMAZING movie). I hope you get it! Before I Fall, The Peach Keeper, and Beauty Queens are all wonderful. I didn't like Everything Is Illuminated nearly as much as Extremely Loud and Incredibly Close, but the movie was awesome. I've GOT to read the Night Circus. Everyone seems to love it. I loved The Peach Keeper. :) I am adding The Last Time I Saw Paris to my TBR, it sounds really good! Before I fall is SOO good. I read it a few months ago and loved it. I've read some Hemingway, but I need to read more. Any book by him would be an excellent present. Before I Fall is amazing. I think it's Lauren Oliver's best book. I would also love The Night Circus or The Sun Also Rises. I've been dying to read them forever. Love your list! I just bought "Everything is Illuminated". I think that it will be a good one! Great list! The Peach Keeper is also on mine. I love Sarah Addison Allen's writing! The Night Circus rocked my socks off. I hope you like bare feet. Great list! I'd love to get Night Circus as well! Awesome list :) The Night Circus is always jumping out at me too. I just read The Sea of Tranquility and it was AMAZING. Like, I cannot even write a coherent review yet amazing. Before I Fall is so good!! I have the Night Circus but haven't started reading it yet. Before I Fall! I forgot to put that one on my list! I haven't read it yet either. I recently read The Peach Keeper and really enjoyed it, Sarah Addison Allen is amazing! I can't wait for her new one to come out (The Lost Lake) in 2013. It doesn't even have a description and I'm excited. :) The Lover's Dictionary is one of my favorite books ever. Before I Fall is incredible! I've asked for The Diviners by Libba Bray because I've never read anything by her, but I've been looking at Beauty Queens as well. I really need to read The Night Circus as well! Great selection. Hope Santa treats you well! Happy reading. Late to the party, but made my list... Now we just need someone to check it twice and bring me the goodies! I am currently reading Beauty Queens and it is hilarious! So tongue-in-cheek! I have a Lauren Oliver book, Delirium, which I have wanted to read for too long now. Night Circus was a great read! Here's hoping Santa is good to you. Thanks for hosting TTT. Thank you so much for hosting this fun meme! This is only my second time, but I love the topics and how challenging they are!! And I think I can honestly say that I don't think I have heard of the books on your list. I kind of stay in my little bubble when it comes to books, but this may be the push I need to look at other things. The music book on your list sounds really interesting! I'd love to read more of Libba Bray's work and Beauty Queens sounds great! Should have put it on my list for Santa! Beauty Queens is funny - but it is a very smart funny. And the funniness actually has a purpose, too. Also, if you like audiobooks, this one is amazing! I am going to see Libba Bray at an author event this Sunday, and I am so excited. I hope she can sign Beauty Queens for me. Loved The Sea of Tranquility & The Lovers Dictionary! I liked Before I Fall! can't wait to see what you think of them! I still need to read Before I Fall and Beauty Queens. I LOVED THE SEA OF TRANQUILITY. Caps lock doesn't even do it justice!!!! I'm sure you'll love it too :) I've been telling everyone to read it! I loved the Night Circus, and would love to read The Peach Keeper, I love her books! Beauty Queens looks awesome, and I can't wait to read The Night Circus too! I have yet to read anything on this list, but Lauren Oliver's Delirium is on mine! This was such a fun TTT! It was exciting going through my ro-read shelf on GoodReads and figuring out what I REALLY want! The Night Circus is on my list too...even though i have the audio version lol. I need them both!! I loved this week's topic!! Fabulous! I have seen The Night Circus on a number of lists. I haven't read it, but I would like to, and I have heard good things about it. It's so long though. I hope Santa is good to you this year. Loved The Peach Keeper. I've loved everything by Sarah Addison Allen! Ooooo - some new books to add to my TBR list! i still need to read the night circus, too. i have had the book for ages and just haven't gotten to it. and the lover's dictionary looks so cute. i might need to pick that one up soon, too. i hope you get everything on your wishlist. happy holidays! The Night Circus and The Lover's Dictionary are on my WANT NOW PLEASE list fo sho! I feel so sheltered or dumb for not having heard of any of these. But after looking them up on Barnes and Noble, they all look amazing! I think I need to add Night Circus to my list as well. I really want to read that book. Great list! I'm embarrassed to say I got halfway through Night Circus and still haven't finished it. I think I'm scared to learn the ending. Before I Fall and Beauty Queens is sitting on my shelf waiting and waiting for me to finally make time for them. Good list. I really like the Top 10's lately! Thanks for the fun! The Night Circus is one of my favorite books of all time, I think. Amazing imagery in that one. Before I Fall was really good, too. I hated, however, Beauty Queens, it wasn't my cup of tea. One of these days I will read Night Circus. I would have added The Night Circus to my own list, if I hadn't been doing a very specific theme.